The nearly block long row of intact historic buildings along Locust Street at 10th in downtown St. Louis has a new owner and a new plan. TWG Development of Indianapolis closed on the long vacant buildings last month. 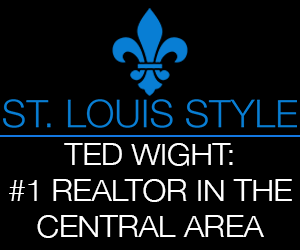 Reached for comment by nextSTL, J.B. Curry of TWG confirmed redevelopment plans. In the works are market rate apartments for the three mid-block buildings, including the three-story 913 Locust, 12-story 917 Locust, and four-story 919-921 Locust. Initial plans call for the replacement of the corner building at 923 Locust with a new retail building. The existing building is well known for its late 1940s Tudor style makeover. nextSTL has chronicled the building’s interesting history as an art gallery in this profile: When the Art World Came to St. Louis. Planning is at an early stage, but if all the benchmarks are met, work could begin in Spring 2017. TWG recently completed an historic renovation project with some similarities in Indianapolis. 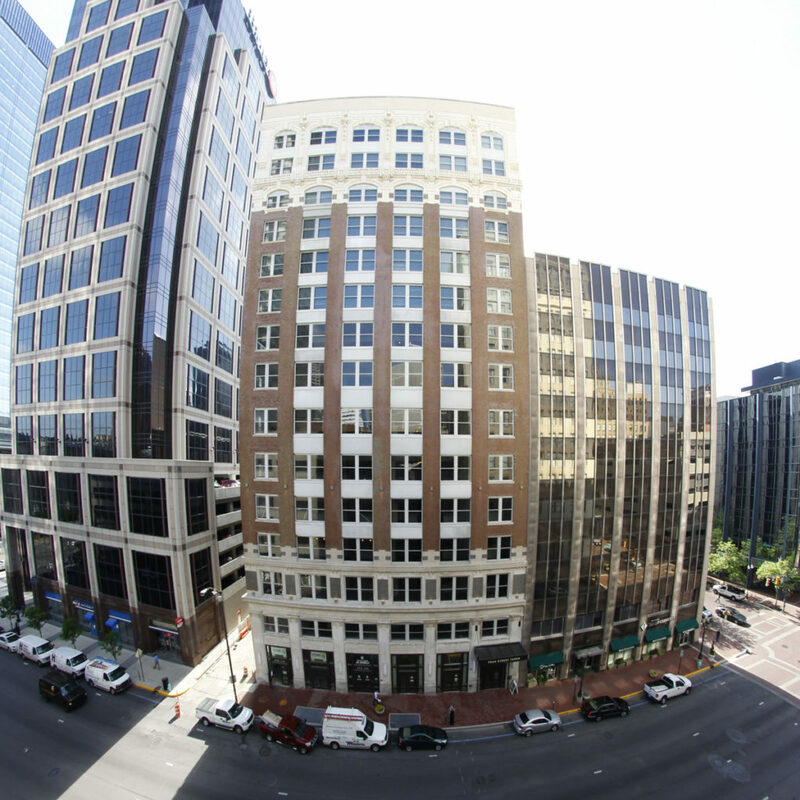 The 14-story Penn Street Tower opened after a 20-year vacancy as 98 apartments last year. The 185,000 sf, 1913 building was renovated at a reported cost of $14M. 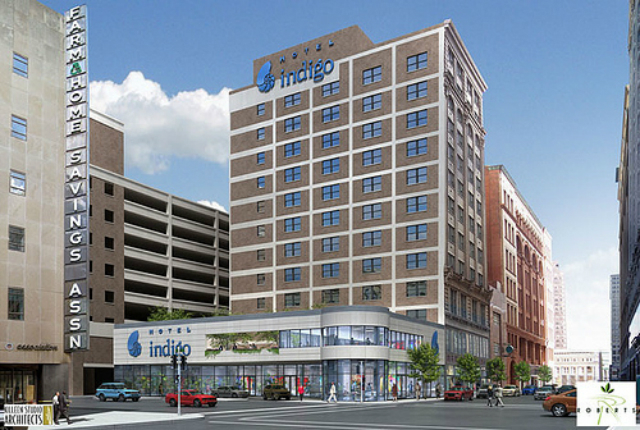 Several years ago, the Roberts brothers planned to demolish the two Locust Street buildings nearest 10th Street (919-921, and 923 Locust) and construct a two-story lobby and entrance for a Hotel Indigo. The plan represented a reasonably urban corner, though introducing a guest drop-off driveway as well. Needless to say, that plan disappeared along with the Roberts empire. In 2012 UrbanStreet purchased the Locust Street properties as part of a package of Roberts Brothers developments, which also included the Roberts Tower, Mayfair Hotel, Orpheum Theatre, and the Lofts at OPOP (Board of Education building). The Tower, once slated for 55 luxury condos, was built out as 132 apartments. Sauce on the Side now occupies the plaza level retail space. The Mayfair became a Magnolia Hotel and underwent a complete renovation, reopening in 2014. The Lofts at OPOP remain rental apartments, with an $800,000 renovation of the retail space completed last year. The Orpheum remains vacant, and plans never emerged for the other buildings on Locust. In October 2008, the Preservation Board unanimously voted to grant preliminary approval to the Roberts Companies’ plan to demolish the two small historic buildings at 921 and 923 Locust Street. The Hotel Indigo plan had lots of support, but Landmarks Association of St. Louis and architect and advocate Paul Hohmann presciently opposed the demolition plans. Now, nearly three years later, the buildings sport for-sale signs, Hotel Indigo has pulled out of St. Louis and possibilities have emerged. Sometimes, the sky does not fall when a demolition is approved. Sometimes, the sky does not have bank financing and shovel-ready plans. The center building (921 Locust) is a handsome three-story brick building with generous fenestration typical of early 20th century Commercial style design. This building dates to 1916, when Martin Monti took out a permit for the building with Nat Abrahams, a prolific minor designer, as architect. The building housed sundry tenants over the years including the Leppert Roos Fur Company and Leacock Sporting Goods Company. This is a bit player in a scene starring lavish terra cotta and penthouse corner offices, but a fine building ready for reuse. Even the absence of windows — oddly removed a few years ago — has not led to any damage. The little timbered folly at 923 Locust Street on the corner gets the most attention of any small downtown building. The Tudor-inspired cladding corresponds to a 1947 building permit taken out by Fischer Optical Company. The scale of the building suggests an old age, but the record is not suggestive. The Badaracco family, later to spawn the last citywide Republican officeholder in aldermanic president Joseph Badaracco, took out a permit to building this building on August 14, 1897. 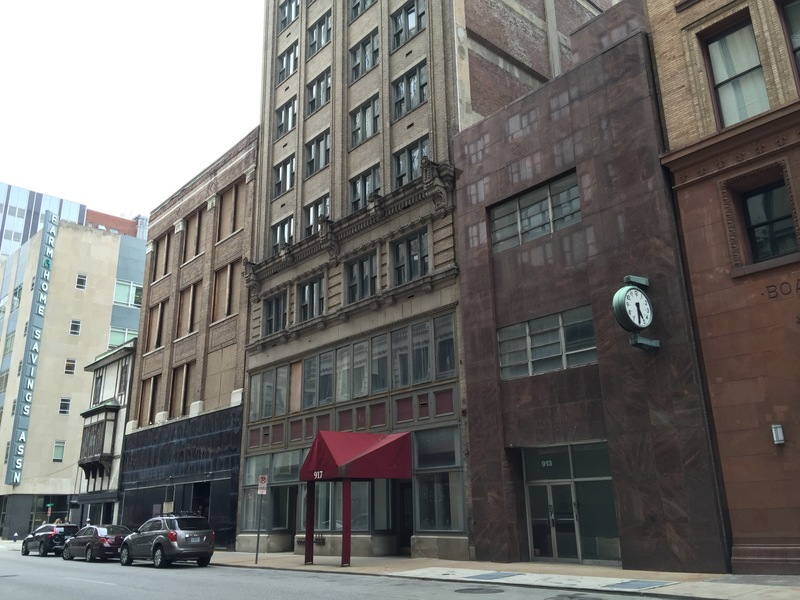 The twelve-story building at 917 Locust Street is now completely vacant, but from 1989 until 2008 was the St. Louis Design Center. The Design Center attempted to lure design-related tenants into one building with shared spaces. (Two asides: Paul J. McKee, Jr. was one of its developers, and Landmarks Association had its office there for many years.) 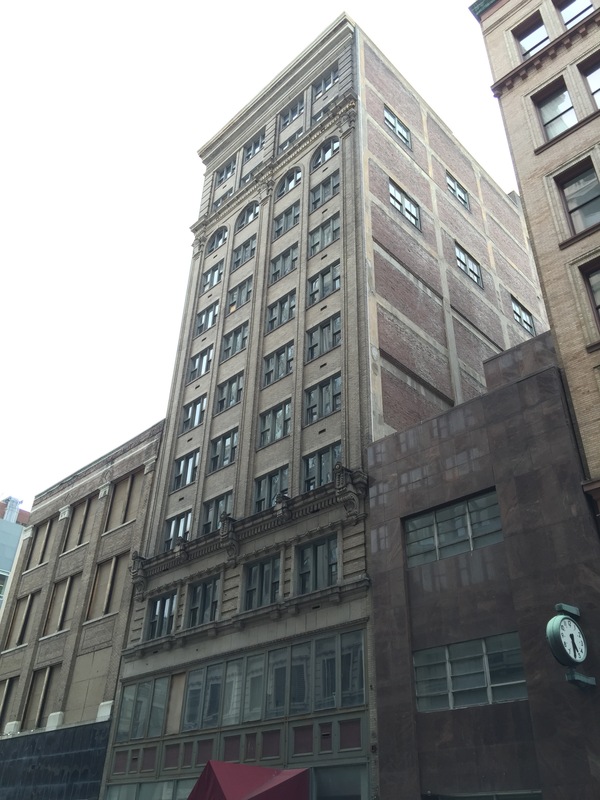 This slender but richly-detailed building was built as a warehouse for Scruggs, Vandervoort and Barney department store in 1913. In the building’s design, architect Harry F. Roach mirrored the bay divisions, fenestration and even specific ornamental details from his massive Syndicate Trust Building across the street (1907). Scruggs, Vandervoort & Barney was located in the Syndicate Trust and Century buildings, so the clear reference made sense — as did the sealed-but-still-extant underground tunnel connecting the department store to the reinforced concrete warehouse annex. Scruggs used the building as late as 1950, and remained in business across the street until closing in 1967.